It’s difficult to watch an 80’s movie and stay silent. Between the plot holes, 30-something “teenage” actors, unsubtle dialogue and “creative” outfits, there’s a lot of fun opportunities to yell at your TV (or use air quotes in its general direction). I doubt anyone was listening all those times I said “someone needs to recreate that outfit”, but Found Item Clothing answered my plea anyway. They make recreations of shirts from “your favorite movies, TV shows and more”, including classics from Teen Wolf (my fave) and UHF. For a Halloweenie, this means that dressing like your favorite obscure 80’s movie character just got a lot easier. But wait, there’s more! Not only does FIC make the shirts, they offer 12 detailed tutorials on how to dress like characters from Real Genius, Ferris Bueller’s Day Off, The Big Lebowski, Beverly Hills Cop, and Wet Hot American Summer. Nerds, rejoice! Thankfully, there are other online resources that save you the trouble of playing the “pause, rewind, pause, screencap” game. If you’ve ever wanted to dress as Bill and Ted for Halloween, you’re in luck. BillandTed.org provides 3 very detailed tutorials on how to make Bill and Tedd costumes from both movies, as well as a fan costume gallery. The Wyld Stallyns shirt is also finally available! Instructables has a thorough Ghostbusters tutorial and 80s Tees also has some interesting costume ideas. Notable among them are Screech, Al Bundy, and Beavis without a mask. About a jillion general 80’s costume ideas are available at In the 80s and Mable’s. If you just don’t have the time or inclination to go DIY this year, several readymade 80s costumes are available from Buy Costumes. As always, you’ll probably find the most unique & genuinely vintage 80’s costumes on eBay. If you have made an 80’s movie character costume or know of a good tutorial online, please let us know in the comments. And because 80’s Tees has so many funny designs, it would pretty much be criminal if we didn’t show a few more of them. The “costume” shirts remind me of those plastic smock costumes from the 70s/80s… in the best way. Enjoy the flashback! Subscribe to comments with RSS or TrackBack to 'Costume Idea: 80’s Movies Costumes'. Last year I was Sookie Stackhouse from the world best T.V. series TRUE BLOOD. This year I’m going to be little red riding hood from Trick r Treat, also a great Halloween movie. 365 Halloween Response: Genius. 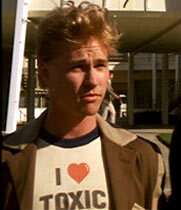 (Although I’m a bit biased because Weird Science is one of my favorite movies of all time.) Gary and Wyatt don’t wear the most identifiable outfits so your best bet would be to go for the “ceremonial” bras on your head and try to get a Lisa to complete your trio as seen at left.